The Woodhoopoes and Scimitarbills are a small African family, Phoeniculidae, of near passerine birds. They live south of the Sahara Desert and are not migratory. While the family is now restricted to sub-Saharan Africa, fossil evidence shows that the family once had a larger distribution. Fossils attributed to this family have been found in Miocene rocks in Germany. The woodhoopoes are related to the kingfishers, the rollers, and the Hoopoe, forming a clade with this last according to Hackett et al. (2008). A close relationship between the Hoopoe and the woodhoopoes is also supported by the shared and unique nature of their stapes. They most resemble the true Hoopoe with their long down-curved bills and short rounded wings. According to genetic studies, the two genera Phoeniculus and Rhinopomastus, appear to have diverged about 10 million years ago, so some systematists treat them as separate subfamilies or even separate families. The woodhoopoes are a morphologicaqlly distinct group, unlikely to be mistaken for any other. These species are medium-sized (23 to 46 cm or 9 to 18 inches long, much of which is the tail). They have metallic plumage, often blue, green or purple, and lack a crest. 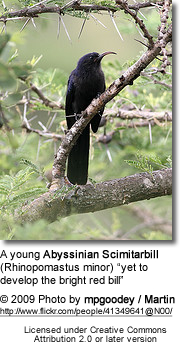 Males and females look alike in all but one species, the Forest Woodhoopoe. Their bills are either red or black, although young red-billed species also have black bills and bill colour is correlated with age. The legs are scarlet or black; the legs are short, with thick tarsi. When climbing up the trunks of trees the do so in the manner of a woodpecker, and when feeding on the ground they hop instead of walking like the true Hoopoe. Their tails are long and strongly graduated (the central feathers are the longest), and marked conspicuously with white, as are their wings. These are birds of open woodland, savannah, or thornbrush, and are mainly arboreal. 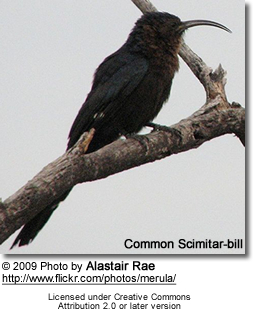 They require large trees both for feeding on as well as to provide hollows for nesting and nocturnal roosting. Two species are found exclusively in rainforest, the Forest Woodhoopoe and the White-headed Woodhoopoe, all the other species are found in more open woodland and bush. They feed on arthropods, especially insects, which they find by probing with their bills in rotten wood and in crevices in bark. They nest in unlined tree holes, laying two to four eggs, which are blue, grey, or olive, unmarked in most species.